Home » Enjoying Nature » And That’s a Warning We Take Very Seriously! Almost every evening for several days now we’ve been watching three tiny baby skunks as we work in the garden. 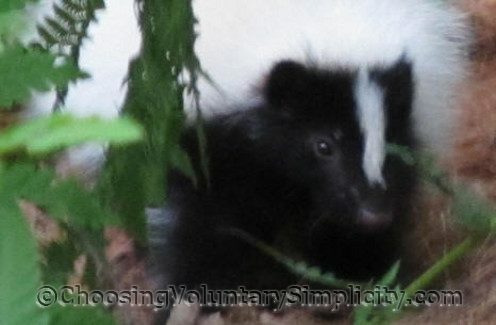 Two are mostly white except for black markings on their faces, and the third baby has the more usual black-and-white skunk coloration. They are about the size of six-week-old kittens, and they’re just adorable! They’re also very playful and roll and crawl all over each other as they nose around looking for something interesting to eat. The babies are still so young they aren’t afraid of us at all, but we always watch their antics from a respectful distance because we aren’t the only ones keeping an eye on their playtime. Skunk number four… a very large, almost entirely white mother skunk… is never very far away from her babies. Skunks are gentle creatures, but like most animals they are very protective of their young. She watches them, and she watches us, and if her babies move too close to us, she doesn’t hesitate to stomp her feet or raise her tail… warning US to move away or she will spray. I too have been watching little skunks the past couple of weeks and they are fun to observe – from a very safe distance. Just this morning I saw two of them frolicking in a grassy area of my condo complex as I left for work and it was a great way to start my day. It’s always a special treat to see wildlife – especially when you live in a big metro area like I do. Skunks get a bad rap imho. Sure they will spray when threatened but for the most part they’re like you said, gentle creatures. 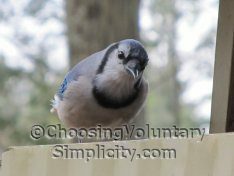 I have one that I’ve seen around my backyard for several years and he/she’s like an old friend. I’m a little jealous, I wish I could see the skunk babies playing too! I enjoy your blog, posts like this are one of the reasons why. That’s just too-too cute. So sweet! Thanks for sharing. I had never seen a white skunk until this spring. We have one and it is not albino because the eyes and nose are dark. The fur is absolutely snowy white. This is such a gorgeous creature. Your skunk babies ARE adorable. Love them! I too am learning to live in harmony with everything around me, even spiders. Trying to fit into their world rather than force them to get out of mine! Can’t believe we have so much in common! I had skunks as pets when I was a kid, and just last week released a litter of 5 baby skunks that I bottle fed. Their mother was killed on the road and my yellow lab (gentle soul as well) found them the 1st week of June. They did not have their eyes open yet. They were so much fun! But, as with all wild animals, they belong in the wild. I go back every evening to the release site, and the food I leave is gone, but I haven’t seen hide nor hair of the babies. :( They were proficient with recognizing natural foods that can be readily found in these parts before their release, so all I can do is hope for the best. Love your website! So much to read! I’ve never actually smelled the skunk spray thingy these wee guys do (inveterate city girl here lol). Is it really as eye-wateringly awful as is always implied – a stench unlike any other – or is it more your run of the mill nasty smell, like I dunno, too many cats in one poorly cleaned flat, or rubbish, or something? Also, is it true that tomato juice helps combat it? and if it is, do you know why that is? As we don’t have skunks in the UK I have been fortunate enough never to have experienced their smell. However, we have had a rat die under our floor once and I now know where the “to smell a rat” comes from. It was the most undescribable vile stench. The worst part was that it went on for so long. Days would pass and we would think it had gone and then the wind would change and it would reek through the house again. We are VERY wary about using bait now. I would rather empty a rat trap than live with that smell ever again.